It is never too late to start doing what you realize you love. It is never too late to achieve what you really wanted to achieve in life. This is exactly what Nadie Kahatapitiya Algama did recently. A qualified Engineer and Director Marketing and Strategy for KIK Group of Companies, Nadie waited for several years to make her childhood dream come true. Recently she released her first official music video `Ves Muhunak’ on YouTube and has become the talk of the town. She joined Melodies to voice how this music video came about. “Right throughout my school days I loved singing, but I was studios so I concentrated more on my studies. 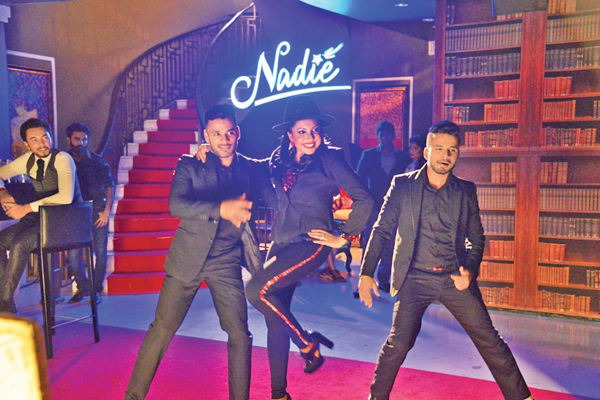 Becoming a singer, doing a music video has always been on my mind as I am an extremely creative person and love music, dancing and singing,” Nadie said. Just like for many others, it was Nadie’s mother who nurtured the talent she had within. “It was my mother who identified my talent to sing. Whenever we had a get together she would ask me to sing. She created the positive vibes that made me gain confidence. She acknowledged the talent I had and provided love and recognition. I sang on Radio Ceylon and Rupahavihini and at a very young age I had all the confidence to perform. I also did an advertisement for KIST Tomato sauce when I was small which was awarded the best advertisement in 1995. I took part in school productions and acted in many teledramas. When I was five or six years old I sang for Malini Fonseka’s movie `Sandamadala’. I sang the theme song in a film called `Challenges’ by Udayakantha Warnakulasooriya way back in 2011. In 2010 I entered the Revlon Miss Universe contest and ended up being in the top ten finalists. Recently I wrote the English lyrics for the theme song of a back to school event at my school Musaeus College. I have compeered in many occasions and am also a toastmaster,” she explained. Nadie enjoys singing in different languages and sings in Sinhalese, English, Hindi, Malay and Tamil. She finds music fascinating despite the language. “Sometimes even though you don’t understand the language you can enjoy the music. I love all genres of music. I relate to people easily and I love the whole aspect of artistic world. But my father being a Charted Engineer and having his own business and I being the only child knew their expectations. Following my father’s advice I did Advance Level in Maths stream and decided to do Engineering. I knew they wanted me to take over the family business and I was engrossed in studies to reach their expectations. However my dream of doing a music video never left me,” Nadie voiced. Her dream safely enveloped in her heart Nadie pursued her higher studies in Electrical and Electronic Engineering. “There are only a few women qualified in Engineering. It was challenging to follow Engineering. I did my first Masters at in Electrical and Electronic Engineering at the University of Bristol. There were only 10 girls among the 100 students following the degree. The first year was extremely challenging. I took up meditation at this time to keep calm and get through the stress and the pressure of studying. I was away from home and it affected me largely but finally I managed to get through that time. There onwards I was able to nurture my creativity. I took part in many performances in the university, was a student representative and did a lot of public speaking. It gave me immense exposure and recognition and I made lasting friendships that I treasure all my life,” Nadie said. 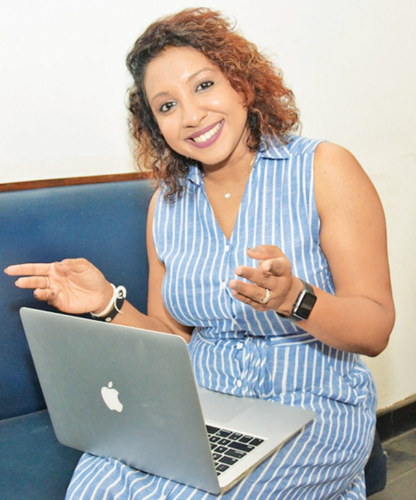 Then she did her second Masters in Business Administration and topped the batch at the Post Graduate Institute of Management (PIM) affiliated to the University of Sri Jayawardenepura. “Both my husband and I did the MBA and once again I proved that it is important to excel at whatever you take up in life,” she added. Life brings about the most unexpected when we least expect it. Nadie met veteran singer and musician Keerthi Pasquel to join him in one of his songs to finally realize her dream of becoming a singer. “One day while I was just humming a tune, the lyrics for Ves Muhunak just came to my mind. I started writing and there I had my first song. Keerthi Pasquel has been supportive from the beginning and encouraged me immensely. He did the music arrangement for the song. Chamil Pathirana of `Thala Rupa’ did the video and script while Lahiru Perera did the mixing. 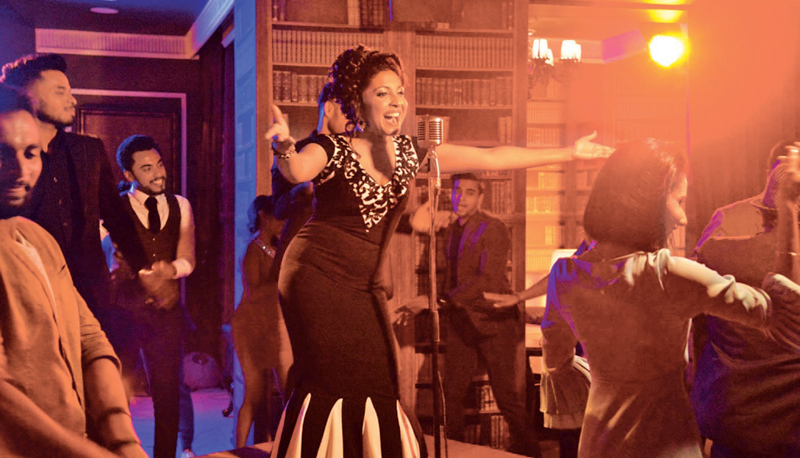 It was amazing and the response I am receiving for this video is overwhelming,” Nadie said. “I wouldn’t have done this without the support of my parents. My parents Indira and Lalith Kahatapitiya have showered me so much love, support and encouragement. My husband Lakshan Algama is my strength and is ever supportive of what I do. He is also a Director at KIK Group of Companies. My in-laws Thilak and Kumari Perera Algama have also being very supportive and I consider them a blessing in when I look back at what I have achieved. When you are married the expectations are high but my family has been pushing me forward to realize my dream,” she added. Alongside her music she manages her father’s business as well. “The main focus of our company KIK Lanka (Pvt Limited is to provide optimum solutions for Low Voltage power distribution and control requirement s and provide modular enclosure products for export markets. We are keen in getting the much needed foreign exchange in to the country. We do a lot of work in export markets and have earned their trust with quality, customer focus and integrity. I am working hard to promote trade in electrical and electronic industry and improve the business climate in the country,” she explained. Nadie feels Sri Lanka need positive transformation. “Music connects people in different ways. I need to be fulfilled in what I do and give people a positive message through music. I want my songs to be fun and inspirational at the same time. That is why I chose the slogan `voice with a poise’ to launch my songs. Sri Lanka is at a stage where it needs inspiration and motivation. We need to help each other to raise the standards of the nation. It is the right time now to inspire and motivate people. There are quite a few songs with good meanings and lyrics that can reach the international audience. I believe whatever we do we have to do it with the right intention otherwise it won’t be sustainable,” she concluded promising her fans more meaningful songs in the future.